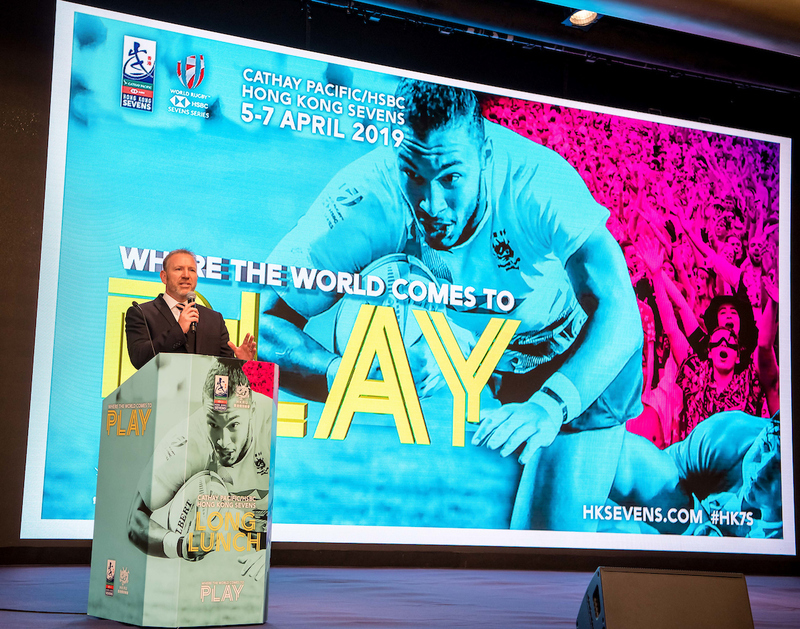 Last Friday saw the staging of the much-anticipated annual Cathay Pacific/HSBC Sevens Long Lunch at the Grand Hyatt Hotel, with over 500 guests gathering together in ritualistic fashion to mark the countdown to the 2019 Sevens. The entertainment was, as always, first class with Big Jim Hamilton’s stories leaving the audience in stitches, Wallabies legend Michael Lynagh providing some great insights into the state of the game, and comedian Keith Farnan finishing off the afternoon in rib-tickling style. As always, glasses were not the only things being raised during the course of the event, with over HK$500,000 donated for the Laureus Sport for Good Foundation, the official charity of the Sevens, to help change young lives here in Hong Kong and across the region. Last year the funds raised enabled Laureus to support a range of programmes including Hong Kong Deaf Rugby whose inspirational coach Winnie Cheung was one of the nominees in this year’s Spirit of Hong Kong Awards. Another group to benefit was Operation Breakthrough, a police led initiative that uses sport to help at-risk local kids – 24 of whom have actually gone on to become police officers. Inspiring Hong Kong also received funds to support their work empowering disadvantaged youngsters, teaching them life skills through sport, and Child Fund received support to expand their fantastic Pass it Back programme, which targets children from Laos and Vietnam facing challenges around poverty and inequality. The partnership with Laureus has seen the HKRU’s own Community Foundation expand their efforts with Prison Rugby, Wheelchair Rugby, Special Needs Rugby, and they will shortly launch new programmes focusing on helping youngsters with ADHD and also an initiative to foster friendship and understanding between youngsters from Hong Kong and the mainland. Since its inception, Laureus has raised more than €100 million to support over 150 community sports-based projects across the world, helping to improve the lives of millions of young people by using sport as a means to tackle some of the world’s toughest social challenges. Laureus is supported by a network of sporting legends, and attending the Lunch were Laureus Ambassador Annabelle Bond and Laureus Academy Member LI Xiaopeng, one of the greatest gymnasts of all time, winner of an incredible 4 Olympic gold medals. The Union also used the Lunch to launch the HKRU Community Foundation Ambassadors Programme – there are 500 Ambassador bricks available, and each brick costs HK$2,000 which will be split between the Community Foundation and Laureus. Ambassadors will be listed on the Foundation website, receive invitations to exclusive events, get regularly Foundation news updates, and will be offered volunteering opportunities on the programmes. The first 250 to sign-up will also receive an exclusive, limited edition Laureus Rugby Ambassadors print.